Linking up with Lisa Jo and all the Five Minute Fridayers…on Sunday…. Fun Story First – I switch between doing 7 Quick Takes and Five Minute Friday on Fridays and the strangest thing happenned last week. I saw the two bloggers that host the two different link-ups tweeting back and forth…I felt like my two blogging worlds collided. I also thought how cool it was that they both love each others link-ups and read the posts of the people that link-up. It was really cool to read on twitter. A few weeks ago at Allume I met Lisa Jo it was really cool…I felt like I was meeting a famous person but really she is just like everyone else! That’s the awesome thing about blogging conferences you feel like these “big bloggers” are these famous people but really they are just normal people just like you and I. TREE. It’s funny that this is this weeks word because yesterday at the Confirmation Prep class I taught I used a tree to talk about the Catholic Social Teachings. See a tree has ROOTS..and it needs roots in order to survive. Just like a tree has roots our FAITH has roots. Do you know where your faiths roots are burried? In the BIBLE or SCRIPTURE! In order of us to understand the tree branches and the social teachings we must understand the documents and the bible. Once the branches have grown we then get LEAVES. 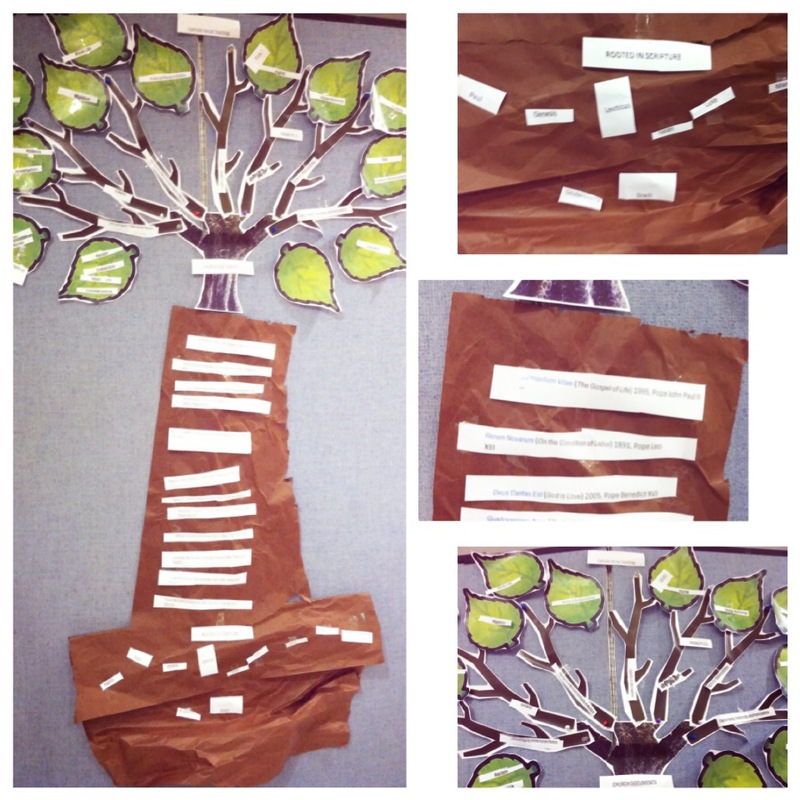 The leaves represent the different issues that we have in society. 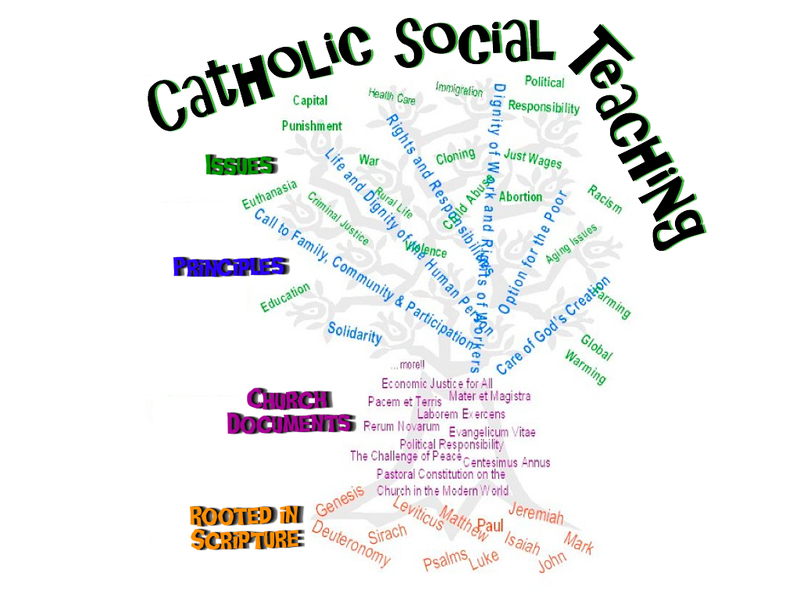 The Social Teachings help us to understand the issues and help us find ways to fix and help the issues. The Social Teachings of the church is why we are to go out into the community and live the gospel and when necessary use words. Someone from Catholic Charities came and spoke to the young adults at Theology on Tap a few years ago and they used this TREE example in their talk. Ever since then I have used it every year to teach the confirmation students about the Social Teachings and it always goes very well. I think it’s a very tangible example to show how everything connects back to scripture. 101 Secrets for Your Twenties ~ Book Review ~ The Book that CHANGED my LIFE! !